It's normal to approach the things we want to do from where we are, but does that actually make sense? In approaching my life from where I am I am already setting boundaries and limits. I am looking at my life, my abilities and commitments as a starting point and already I am placing obstacles in my my path. I am a child of God, living in the fullness of his promises, and God's promises are always bigger than I can think. He can do more than we can ask or imagine (Ephesians 3:20) so why am I putting my life in a box? What if I approached my life differently? What if I walked backwards? God wants us to dream big, without boundaries, and then work backwards from that dream to find the next step. We limit ourselves when we look for the next step from the place of our obstacles. What could you do if you didn't focus on the obstacles, or what seems normal or doable? God works outside of the normal - not in the comfortable but in the challenge. The challenge you face may be physical, financial, spiritual or emotional. It may be our own limitations that hold us back - not actual limits but the things we feel, or think we can’t do. Sometimes for no other reason than because we have never done it before or cannot imagine that is is within our realm of possibility. The point that we're missing is, we're not working within the realm of what we can do but in the realm of what God can do. Possibilities with God endless, limitless and without boundaries. Our own limits are usually bound up in fear and doubt. The mere nature of those limits are a warning of their origin - negativity is not from God. Fear and doubt are not from God. so, what is it that God gives us that overcomes our own frailty, our own belief of what we are capable of? In 2 Timothy 1:7 it says that we have not been given a spirit of fear, what God gives us instead is power, love and self-control. Recently I have really been getting a grasp on the fact that as children of God, heirs with Christ we have the same power and authority as Jesus, we have the ability to love as he loved and we have control over our thoughts and deeds. It is with that kind of power that we are able to take a step toward what may look like an impossible dream. Spend some time with God asking him to open your heart and mind to the big dreams, the if only things you'd like to do and lay them before him. Trust he is able to do more than you can even imagine, and ask only for the next step. 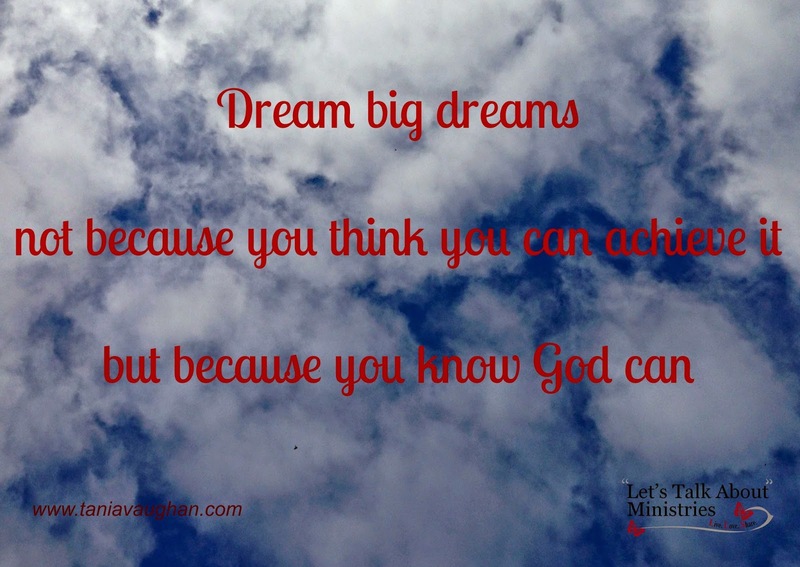 Dream big, and live the full life that Jesus came to give you. These last few days I have been having to be intentional about keeping my mind staid on TRUTH. unbeknownst to me, I have accepted some lies from the enemy; lies that I had begun to believe were true. One of the lies is about my abilities and how I view myself. Well, I have bookmarked this post and will come back to it again as I meditate on the truth of who I am, who my GOD is and what He is capable of and how fearfully and wonderfully He created me. Thank you sis for a timely word. Tyra - I am so glad you hearing the truths of God about who you are. May you know his goodness and joy as you discover yourself in him. This is just what I needed to hear today. The fear of thinking I can't do certain things can be so real but your words remind us that God is bigger and with Him all our possibilities lie! This truly helped me in a way that I hope will help me to have a breakthrough in one area of my life. Thank you for stopping by my blog and for these words today. Yes, to think that we have the power of Jesus in us. We can conquer it all. Thank you for reminding my soul of this today. I have all his ability to love and to pour out grace. This is real power. Cheering you from the #RaRalinkup. I enjoyed reading this as I've been contemplating dreams this week as well. I like the thought of dreaming big and taking the next step. God bless you as you continue to dream! Tania, I'm stopping by from Grace and Truth this week. I find it interesting that several of the bloggers who linked up wrote on a similar thread about not fearing, about our big God. :) Apparently I needed that message this evening! Thanks for sharing with us!